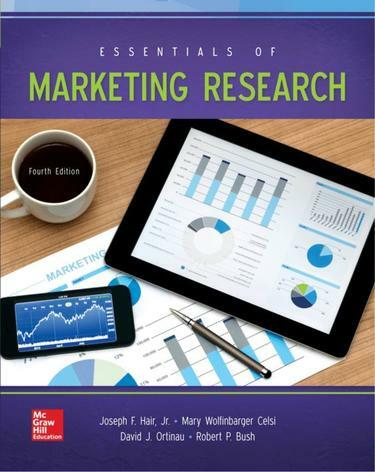 Essentials of Marketing Research delivers a concise up-to-date review of a broad variety of marketing research topics. Its application-oriented approach equips students with tools and skills necessary to solve business problems and maximize opportunities. The authors' years of practical market research experience is evidenced in everything from their thorough treatment of qualitative research (a topic often given short shrift) to their knowledgeable coverage of sample size rules-of-thumb background literature reviews and new market research tools and techniques including new coverage of structural modeling and Partial Least Squares Structural Equation Modeling (PLS-SEM). Essentials of Marketing Research gives students a strong command of market research principles while at the same time being concise enough for use alongside cases and other course projects. Essentials of Marketing Research is available through McGraw-Hill Connect® a subscription-based learning service accessible online through personal computer or tablet. A subscription to Connect includes the following:• SmartBook® - an adaptive digital version of the course textbook that personalizes the reading experience based on how well students are learning the content.• Access to homework assignments quizzes syllabus notes reminders and other important files for the course. • Progress dashboards that quickly show students how they are performing on assignments with tips for improvement.• The option to purchase (for a small fee) a print version of the book. This binder-ready loose-leaf version includes free shipping. Complete system requirements to use Connect can be found here: http://www.mheducation.com/highered/platforms/connect/training-support-students.html.